What is the customs process in Afghanistan to import? How is import cargo released from Afghanistan Customs to importer? Who are the parties involved in import customs clearance formalities in Afghanistan? Import cargo clearance in Afghanistan Customs. The information provided here details on how to import goods to Afghanistan especially import customs clearance procedures in Afghanistan. The importer or a licensed Customs broker may make a Customs declaration in respect of the imported goods. For making the Customs declaration, Afghanistan has adopted the Single Administrative Document (SAD) that enables harmonization of codification and simplification of procedures in international trade exchanges. For automation of Customs processes, Afghan Customs Department has been implemented ASYCUDA, refers to the Automated System for Customs Data software that was designed by the United Nations Conference for Trade and Development (UNCTAD). The ASYCUDA system handles manifest and Customs declaration data, risk criteria and profiles, accounting procedures, and transit and suspense procedures. Requirements of customs to import to TORGHUNDI. Customs requirements in Mazar-i-Sharif to import. Customs needed to import to Kabul. How can I clear customs to import in Herat. 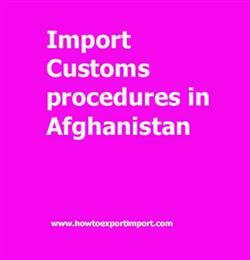 Import customs procedures required in Kabul. Import Customs process in Herat. Process to import to Kandahar. What Customs formalities required to import in Kandahar. What should I do to import goods in TORGHUNDI. Mandatory process need to complete import in Herat The way to get customs clearance process to import in Kandahar. How to get import customs permission in TORGHUNDI. Procedure to get customs clearance to import in Kabul. Ahmad khalid omarzada: On 19 January 2019 what document required for import of raw material from india to afghanistan?